Although it’s already important to regularly brush and floss your teeth properly, it’s even more so when you have braces. You may be brushing and flossing your teeth, but it is essential you do it the right way. Otherwise, it will make no difference whether you brush your teeth or not. So, what’s the right way to brush your teeth while wearing braces? First things first, you must have the right brushing tools. You should use either a bi-level brush or a soft-bristled one. 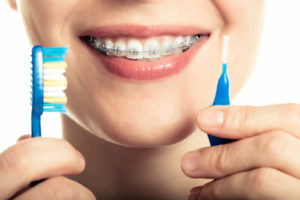 You will find these types of brushes to be highly effective in cleaning the food particles from the ridges of your teeth, as well as from your braces. An electric toothbrush can also be effective just as well. However, you need to be extra careful when brushing. Make sure you are using your electric toothbrush at a moderate power. After all, you would not want the vibrations to hit your braces. If you are having a tough time brushing the areas near the wires and brackets, you can make use of a cleaning tool specially designed for those wearing braces. An interdental toothbrush can reduce your tooth brushing issues and make your life a lot easier. This kind of toothbrush is designed with a small clump of bristles, which makes cleaning around the brackets of the braces, a lot easier. For those who wear braces, there is another cleaning tool called water pick or the oral irrigator. This tool shoots out small spurts of pressurized water directly at your teeth. This helps dislodge any stubborn food pieces that get trapped in crannies and nooks. However, keep in mind that an oral irrigator is no alternative for dental floss or your toothbrush. It is recommended for you to use a fluoride toothpaste and brush minimum of twice a day – preferably after a meal – for two minutes at least. It’s important to brush each and every tooth surface where food particles are easily trapped; front, back, and all chewing surfaces. When it comes to those areas between gums and brackets, and between teeth and wires, you need to pay extra close attention. Most of the food particles are wedged in these places. Here’s a recommended brushing technique: Start from the front surface of your teeth. Hold your toothbrush in such a way that the bristles fall adjacent to your teeth. While you are brushing, make sure to use gentle circular motions to lightly polish your teeth clean. For those areas between the gums and braces, tilt your toothbrush towards your gum line and use circular strokes. Once you get to the chewing surfaces, use a firmer back-and-forth brushing motion. Make sure to brush the back surface using the same techniques as for the front surface of your teeth. Last, but not the least, make sure you floss after brushing at least once a day. Your brushing regime will not be as effective if you miss out on flossing your teeth. If you need some help cleaning them, call us at Angel Dental of El Monte and we can set up an appointment 626) 444-2002. ← Do You Need Anesthesia for Your Dental Implant Surgery?